A brand is many things (it’s an overall experience including perception, voice, values and visuals) but today we are mainly talking about your brand identity or the visual aspects of your brand. The core of branding your business is to first know your target audience. Your target audience is your ideal customer and client which is who is going to buy your products and services. Your branding needs to speak to THEM. You should put personal preferences aside and always put the people most likely to be interested in your product or service first. You should have thought through all of this before designing a logo, picking fonts and colors and turning that into a brand board. 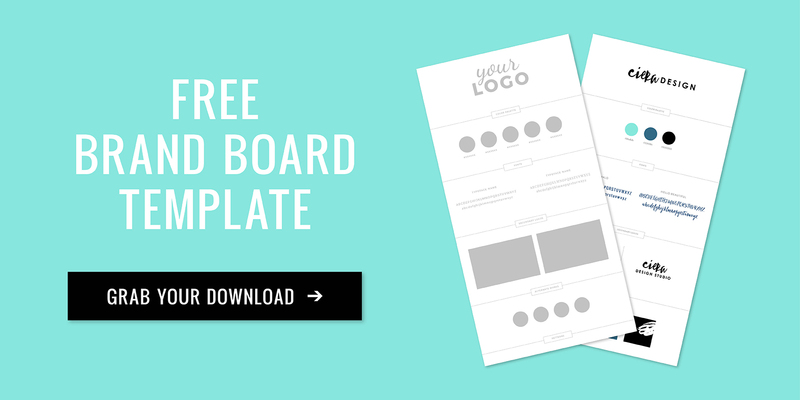 Once you’ve gone through that discovery phase and have your visual branding complete – we put all of those elements into a brand board which will help you to have a clear brand message as well as consistent brand visuals. 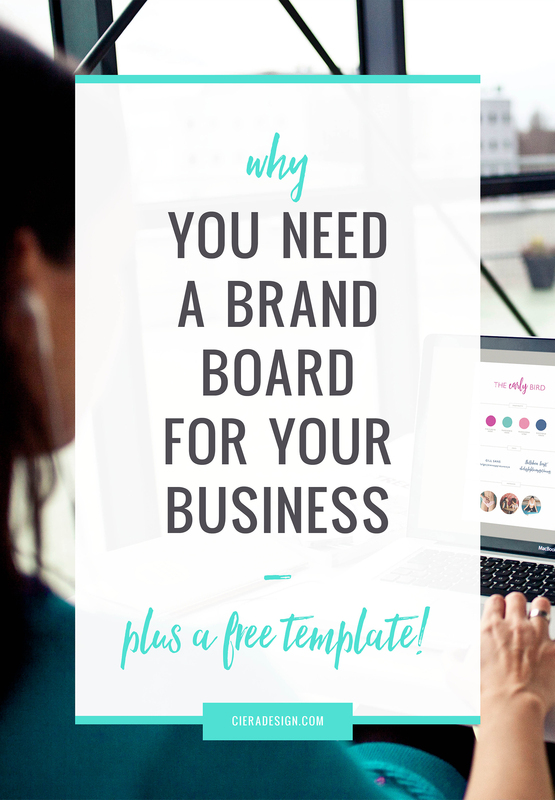 So you may be asking “what exactly is a brand board?” – Well, let’s dive into what it is and why you need one for your business. 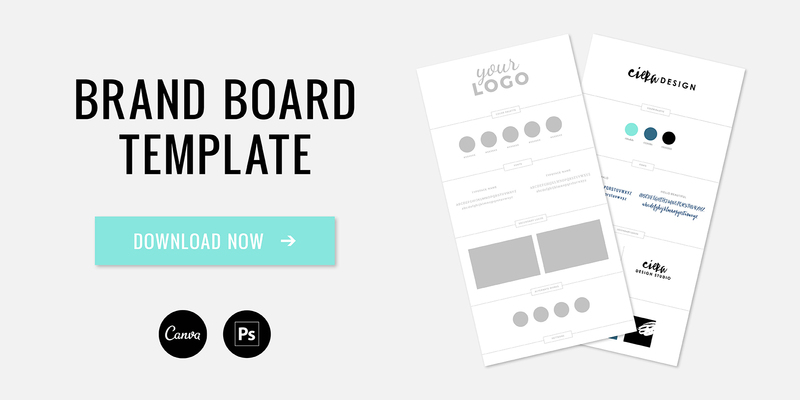 A brand board is a place to pull together all of your brand identity pieces in one neat place. This is a simple document to make sure that everything you put out into the world for your business is consistent. Being cohesive and consistent across all platforms is key to building trust with your customers. Branding is one of the most important aspects of any business, large or small. Whether you hired a designer to create your logo and marketing items or you did it yourself – I know that you put a lot of time into this process. Your website, business card, social media, and printed materials are often the first interface that a potential client has with your business. You have a few seconds to make a good impression and you should be proud to hand out cards and send people to your site. With so many platforms these days, clients should be able to recognize you at a glance through your brand identity. Are your website, printed materials and social sites cohesive? They should be. It can be tempting to stray towards a new trend or try out a new font but having your brand board created and front of mind will help keep your marketing items consistent! It’s so easy to vear off in a random direction without this overall vision bringing it all back together. Your primary logo is the main identifying mark for your business. This logo will be used the most, and is often utilized on the header of a website and on brand collateral, etc. From time to time it makes sense for a visual identity system to have an alternate logo or sub-mark. This could be a different orientation or a simplified version of the main logo to give your brand more flexibility. This logo can be helpful for social media profile images, on social media graphics, as a watermark and other places where you need to use a more compact version of your logo. I typically create a color palette that consists of 3-5 colors. Your color choices should speak to your target audience, be relevant and memorable. Elle and Company has a great post on creating a distinct color palette. In addition to the colors themselves, make sure you include the color codes that you use most, hex codes for web and CMYK and PMS for print. My recommendation is to have two fonts for your brand identity. By choosing fonts that reflect your brand’s values, you can attract the right kind of customers. A serif fonts tends to be more traditional while a sans serif has a more minimal and modern feel. You may also consider a bold slab-serif or a script font which can give a friendly and approachable feeling. This space is for additional design elements that will give your branding depth and interest. They can be used in social media templates or the background of your website, for example. Patterns and textures can add interest to your designs, support your brand message, gives versatility and helps your brand stand out even more. You can also include photographs to make sure your content and editing stays consistent. This can be helpful to turn over to your photographer when to make sure everything stays visually aligned. These elements make up a visual identity. Once you have the basics in place, you can use these elements to create social media graphics, PDFs, marketing collateral, website elements, and so much more. Remember, being cohesive and consistent across all platforms is key to building trust with your customers and having all of your brand elements in one guide that you can reference at a glance is critical in keeping your branding on track.